Holidays: Women's History Month, Daylight Savings Time, Saint Patrick's Day, First Day of Spring, and Cesar Chavez Day (States Vary). 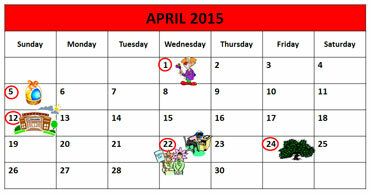 Holidays: April Fool's Day, Easter, Library Week, Earth Day, Administrative Professionals Day, and Arbor Day. 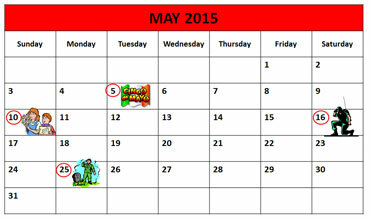 Holidays: Cinco de Mayo, Teachers' Appreciation Day, Mother's Day, Armed Forces Day, and Memorial Day. Copyrights to the pictures and photos on this ESL and EL Civics website belong to individual photographers. We have purchased the rights to use them. Do not copy the images on this educational website. Permission is granted to copy any of the worksheets for classroom or home study. You may link to any page of this free education website. Contact Christina Niven, ESL teacher, at christina@elcivics.com. 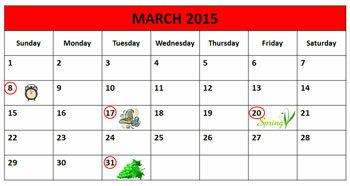 Please send requests for new ESL lessons and worksheets. Copyright © Christina Niven, 2007.